Hours: Sun- noon- 6 p.m., Mon & Tues- Closed for special events, Wed & Thurs noon- 9 p.m., Fri- noon – 10 p.m., Sat- noon – 10 p.m.
Appearance/atmosphere: Although MBTB Tasting Room was voted best wine bar for 2014 in Hour Detroit Magazine, it doesn’t feel like a wine bar at all. It really does feel like a tasting room at a winery. 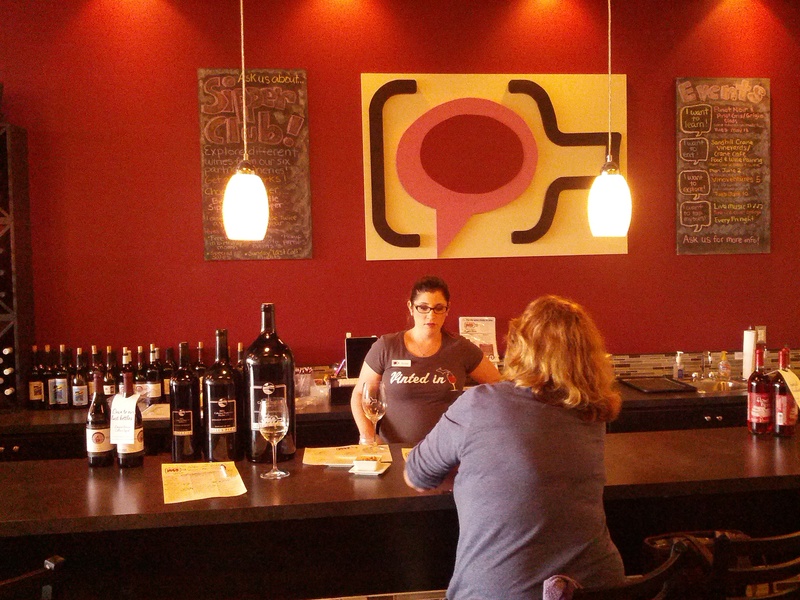 The difference is that it is a tasting room for six different Michigan wineries at once! The outside isn’t much to look at, just a store front in a suburban strip mall. The inside is a bit warmer, but still not fancy by any stretch. It’s bright and airy feeling with nice, ample seating and decorated in the MBTB color scheme. The bar isn’t anything fancy either but feels very much like the bar at a winery tasting room. It’s perfectly up to its task, though. Service: The service was excellent. We sat at the bar and our server Krystal was quick and attentive. I recognized Shannon from the Michigan by the Bottle blog and I introduced myself. He seemed to remember me from our online interactions (or at least faked it very well) and made us feel very welcome in spite of being busy. Cortney briefly appeared but disappeared into the back before I could introduce myself to her. Maybe next time. Both Krystal and Shannon answered all our questions clearly and politely. The tastings work as follows: The server places a paper placemat in front of each taster with circles numbered 1-6 for a full flight (mini-flights of three wines are also available). For the standard flight, each taster circles five regular selections on the menu. Glasses are poured in traditional tasting order (starting with dry whites, ending with dry reds). When a “tour” is purchased, two special pours (and bonus cashews) are included. These are usually dessert wines or at least they were when we were there. Menu/Prices/Selection: The full menu is here. A full flight is $10 or $15 after six (with the extra $5 being applied toward a bottle purchase) with tasty Michigan-made snacks (cheese and chocolate) included. A mini flight is $5/$10. A tour is $17/$22 and a tour for two is double that. If you’re a fan of dessert wines like I am, I would recommend the tour, but if you don’t enjoy them, I would stick to the flight. They partner with six Michigan wineries from around the state. Those wineries are Chateau Aeronautique, Sandhill Crane (both Pioneer Wine Trail), Chateau de Leelanau, Gill’s Pier (both Leelanau Peninsula AVA), Domaine Berrien (Lake Michigan Shore AVA) and Peninsula Cellars (Old Mission Peninsula AVA). I expected a broader selection of wines, but I think how they’ve done it works better than carrying something from everybody. They astutely included two wineries known for reds, Domaine Berrien and Chateau Aeronautique, to complement the fine whites Northern Michigan is known for. Cider and fruit wines are also included. I didn’t love every wine I tried but that’s not really the point. I got to taste some things I would have had to drive several hours to taste and that’s great in itself. The best wines I had that afternoon were the 2012 Dry Riesling from Peninsula Cellars (not surprising given what an Old Mission fanboy I am) and the 2010 Domaine Berrien Pinot Noir. The most surprising selection was DB’s 2011 Marsanne. Michigan is not where one might expect to run into a grape from the northern Rhone valley but it was quite good. All the selections are also available by the bottle, and those prices are helpfully included on the tasting menu. The prices for bottles are about standard and the tasting prices are reasonable considering the number of pours included and the quality and abundance of the snacks. It should also be noted that, also like an actual winery, they have their own wine club. Information on that is here. Transportation/Parking: Unless you’re up for a mile walk or bike ride from the nearest SMART stop on unfriendly roads, public transit isn’t really an option. There is a large parking lot at the shopping center where the tasting room is located, so parking is not a problem, and it’s close to Hall Road/M-59 so getting there is fairly easy. That said, it’s quite a hike out there unless you live in Macomb county. Google maps estimates a 30 minute drive from Sipology HQ and that’s just with good traffic which is a rare thing on Hall Road. Luckily for me and others living in Oakland Co. or Detroit, a Royal Oak location will be opening up on Woodward soon. Parting Words: Overall a great experience was had. We went home with abundant leftover snacks and a few bottles of wine. Can’t wait for the Royal Oak location! It promises to be good for my tummy but probably bad for my bank account and limited cellar space. 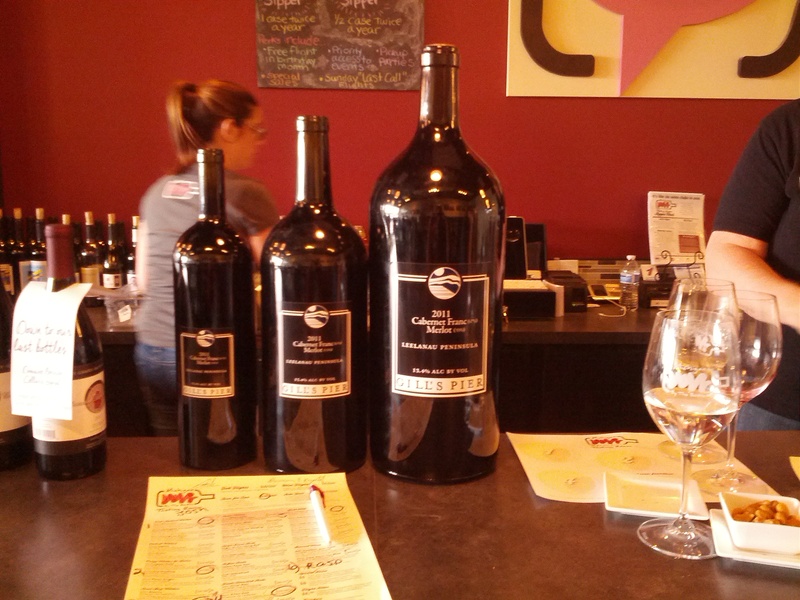 Michigan By the Bottle Tasting Room is recommended. How great that you were able to taste so many Michigan specialties in one visit, less than an hour’s drive from Sipology HQ. I have to ask – how was the cheese?! The cheese was great. I was pleasantly surprised to see that one of the cheses they served was from Grassfields: http://www.grassfieldscheese.com/. They used to have a stand at the Royal Oak Farmer’s Market but had to give it up for some reason. They served Grassfields “Gouda” and a Leelanau Cheese Raclette. Both are worth seeking out.